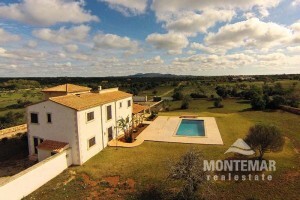 Fincas & Villas for Sale in Es Llombards | MONTEMAR S.L. Es Llombards is located in the south-east of Mallorca, less than 5 minutes by car from Santanyí. Montemar Real Estate is also active for its clients in this area. Montemar Real Estate is well versed in real estate matters. By working with us, you will find a partner able to act on the spot, knowing country, people, language and the law and who is therefore the perfect partner for your purchase of a finca or villa. Like Cala Llombards, Cala Figuera, Alqueria Blanca and many other well-known places, Es Llombards belongs to the municipality of Santanyí in the Migjorn region. In the relatively small village you will find everything you need: small shops, a bakery, cafés and bars are located directly in Es Llombards. For everything else, you don't have to use your car too much, because, as described above, larger communities are very close by and offer all shopping facilities, doctors and other vital facilities and institutions. Cala Llombards is the sandy beach of Es Llombards. The clean, almost unbelievably turquoise water here is just waiting for bathers, who can swim on a 230 meter long and 140 meter wide beach. This beach is especially safe for children and seniors due to its shallow entrance into the water.